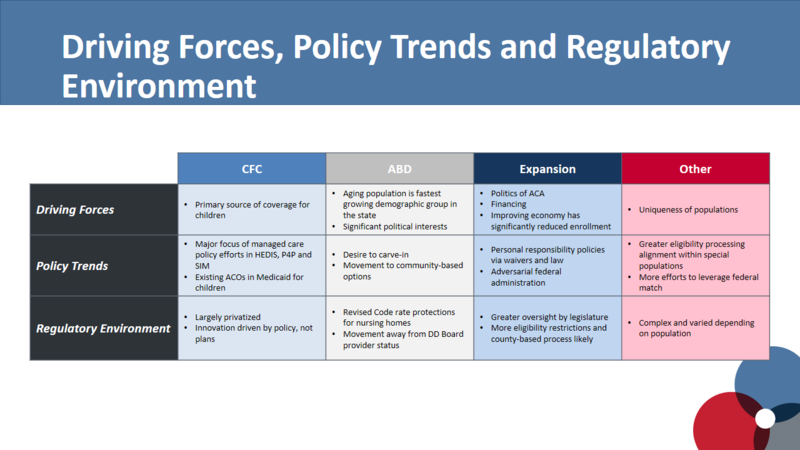 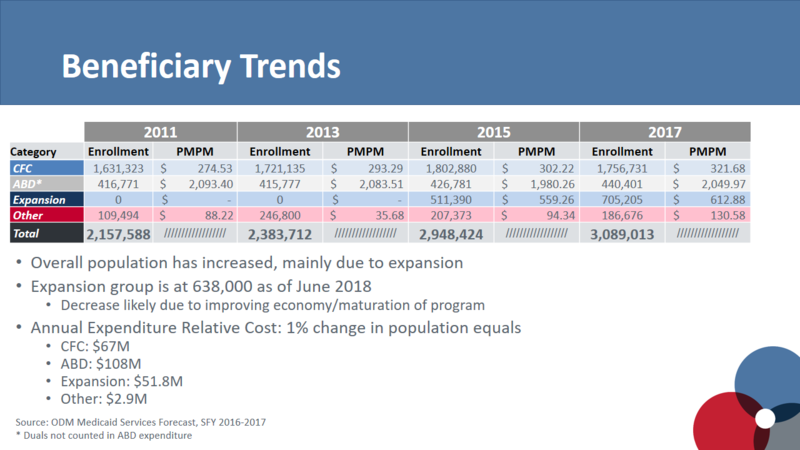 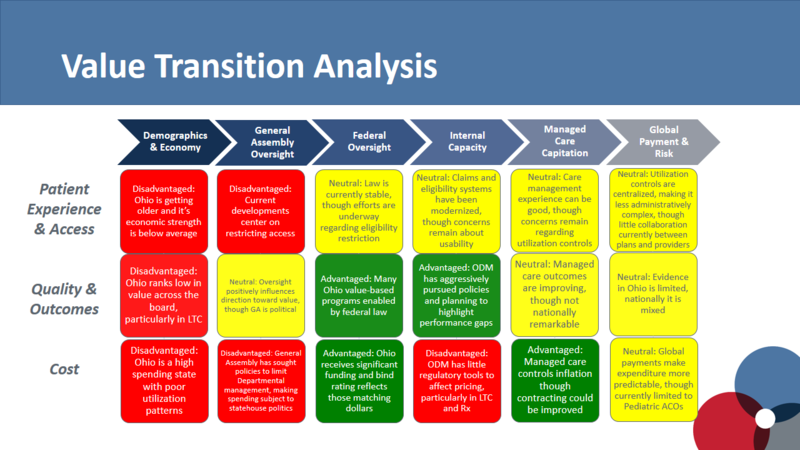 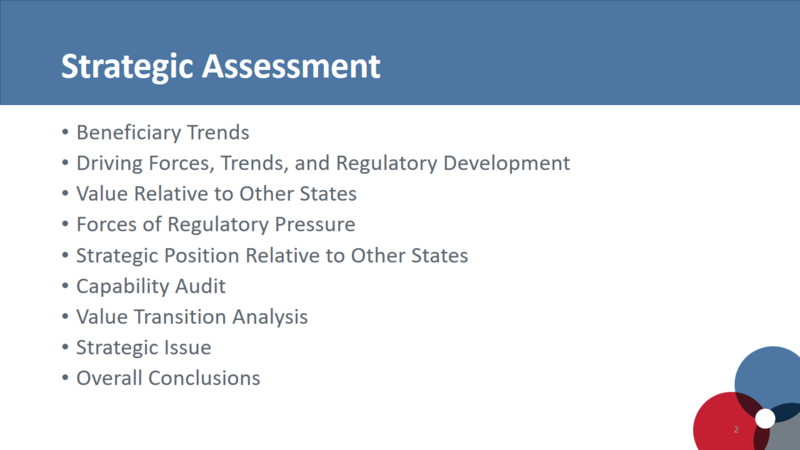 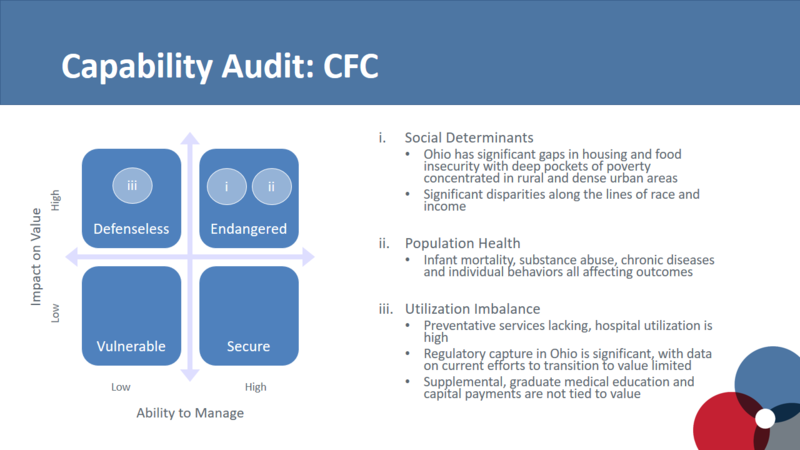 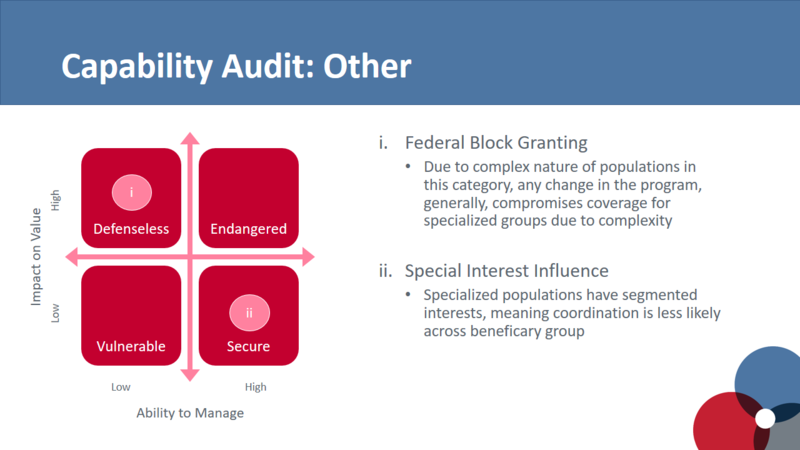 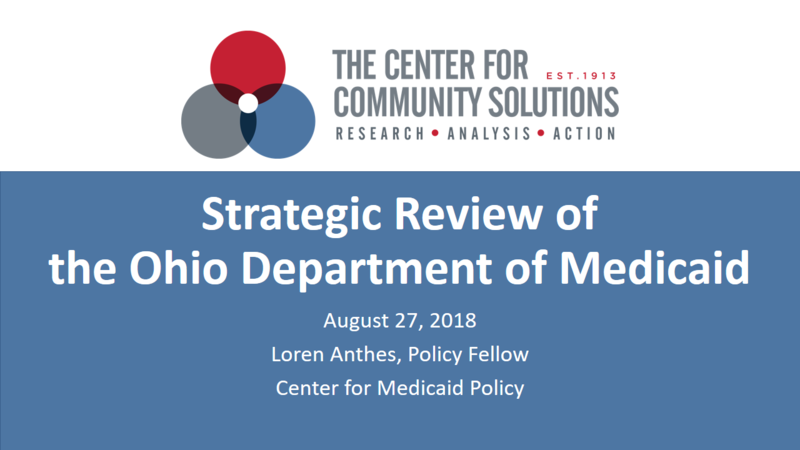 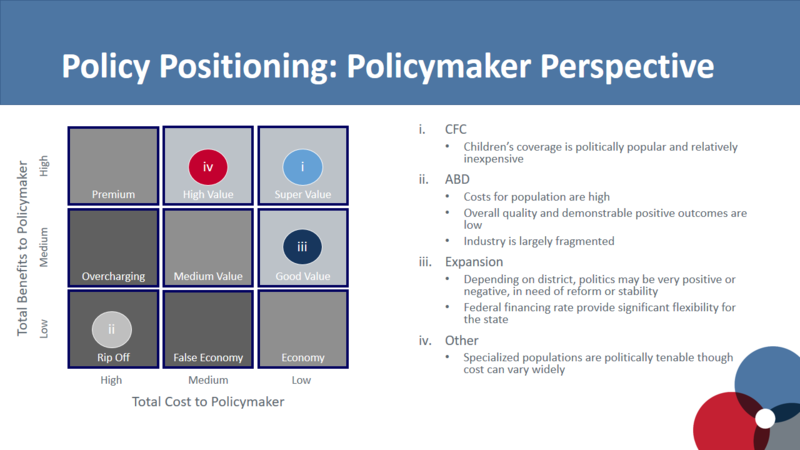 In “Part II: Assessment” of the Strategic Review of Medicaid series, I will take a look at the policy and beneficiary trends in Ohio’s Medicaid program, including taking a look at the current status of Ohio’s efforts to transition to a value-based system. 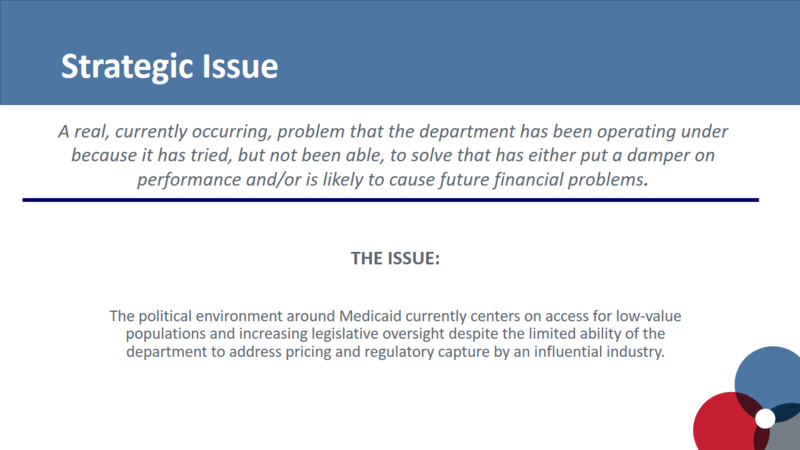 While much has already been achieved, particularly in the areas of access and launching new reimbursement systems through the State Innovation Model, Ohio’s Medicaid program faces a number of complex policy challenges. 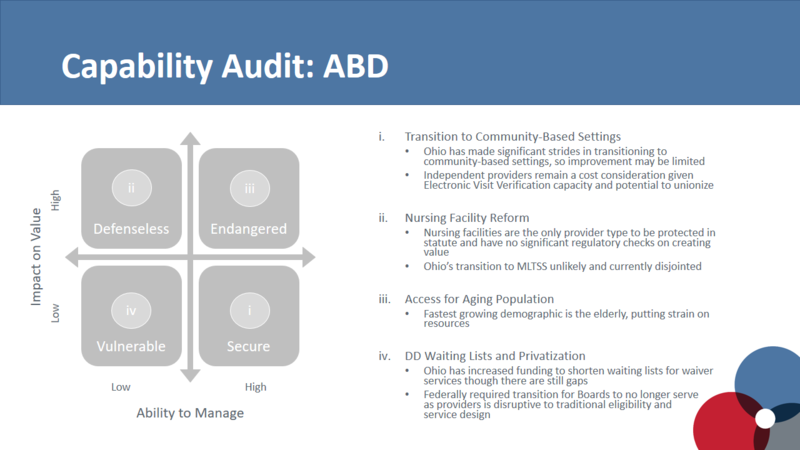 In regards to the populations being served, we see that the overall program has grown, mainly due to the expansion, but that Ohio is also growing older, meaning the most expensive category, the Aged, Blind and Disabled group (ABD), will grow. What’s more, the politics surrounding Medicaid expansion have led the General Assembly to assert itself into a stronger oversight position of the program, generally. 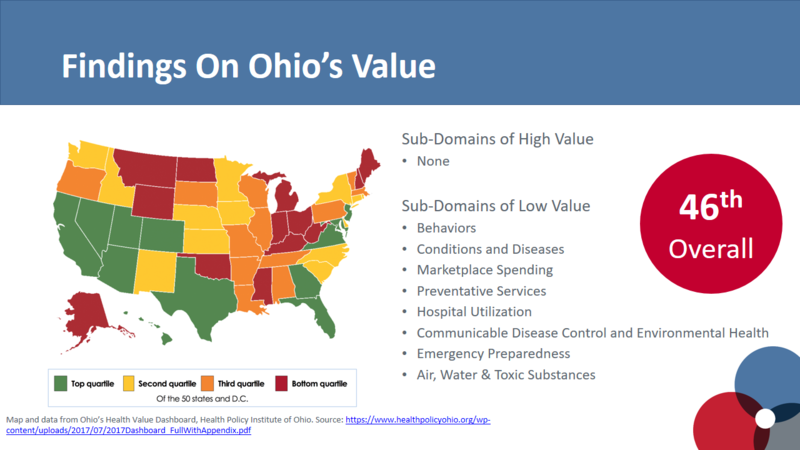 And while the department has implemented a number of reforms to increase value, Ohio is currently a low-value state, ranking 46th, nationally. 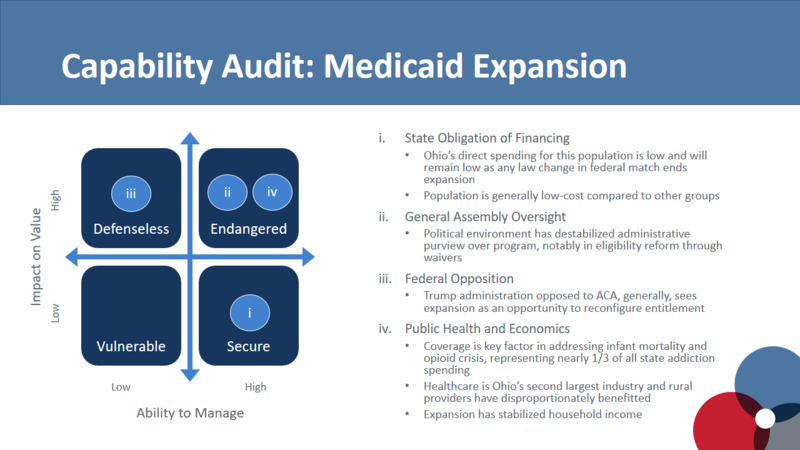 The Ohio Department of Medicaid (ODM) is now in a position where it faces a number of political hurdles, including significant influence on policy design by the industry. 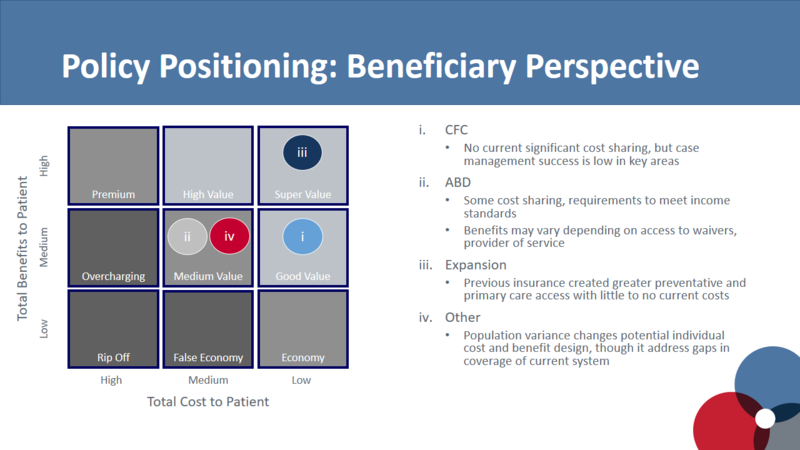 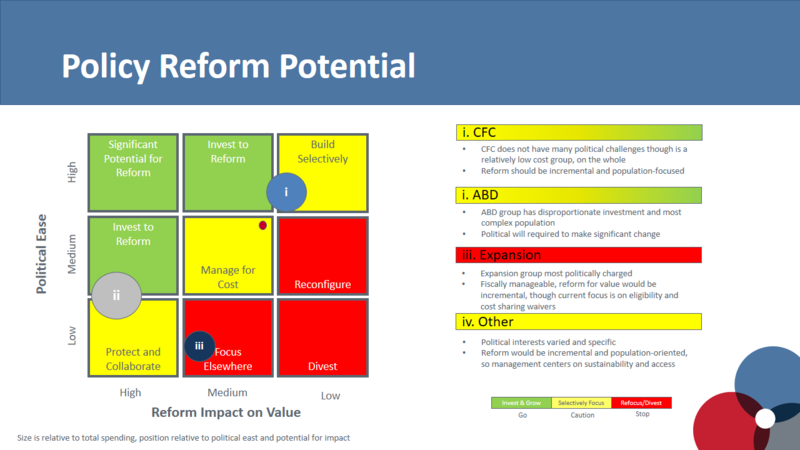 And while some of the major cost centers are moving in the direction of value and quality, long-term care remains the highest value target for reform. 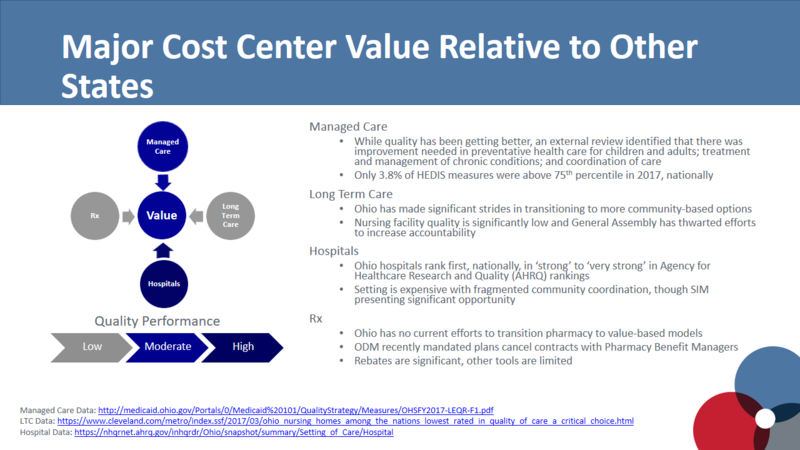 Additionally, ODM’s price control tools are limited, thus affecting the way the state manages its costs. 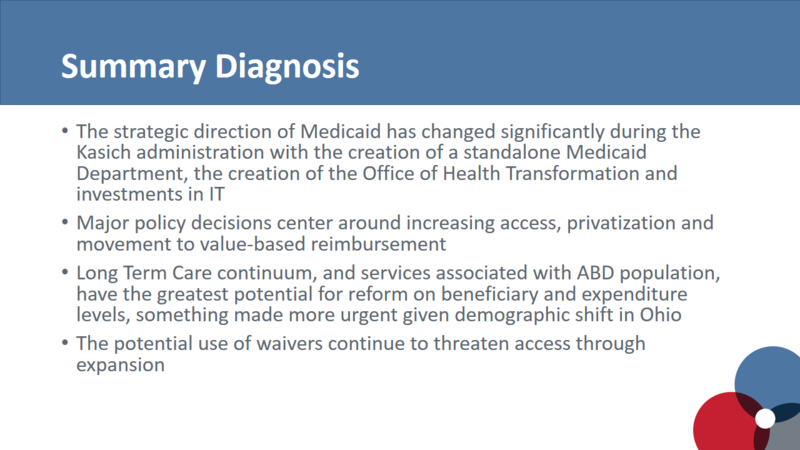 This means value will have to continue to focus on reorienting payments toward outcomes, improving population health and addressing non-medical interventions for social determinants.